Cost is $3 each for one to four bumper stickers, you design and print. Discounted to $12 for five when you print them at the same time. Additional cost when Pub & Print designs and prints for you. UCM will design at no cost for UWG jobs submitted by faculty and staff. Chargeback rates apply. 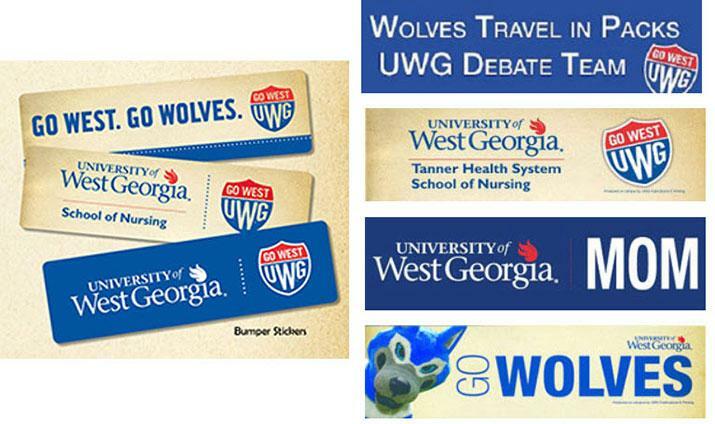 Bumper stickers are also available at the campus Bookstore. Feature your school, college or favorite sport. Print your favorite famous quotation, or write your own. Just open the template, create your bumper stickers, and bring or send your file to Pub & Print. NOTE: Templates unfortunately did not migrate successfully to the new website and are currently under re-construction... To design your own use one of the templates below, full sized on the left, half sized on the right. Click on the template, then use the insert function to bring in your photo or text file. You may also type directly into the template once it opens to full size. Individual stickers are sized 11" wide by 3" tall, five per sheet. For the half-sized sticker, print two side-by-side on the 10-up template. Size for the smaller stickers will be 5.4" wide by 3" tall. The bumper sticker substrate is five-up, meaning five to a sheet, hence the discount for five. Size is 11" x 3". The 10-up template allows you to print smaller stickers, size 5.4" x 3", and get double the number of stickers for the same price.